Boy! Time flies when you're hitchhiking. According to my notes, I started this Hitchhiker on November 16th and I finished it January 12th. That's almost two months of knitting, although it feels like closer to two weeks. I'm SO thankful that Knitting Sarah blogged about knitting her Hitchhiker scarf. The moment I saw it, I knew I HAD to knit one for myself. 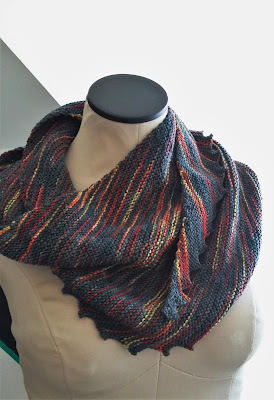 I instantly fell head over heels in love with the yarn and the way it striped on Sarah's Hitchhiker. I ordered the yarn before I even finished reading her review of it. See how the yarn stripes but never pools? I just love it! The yarn itself was great to knit with too. Although I was using super sharp, pointy metal needles (they were my only US 3's available at the time) I never had trouble with the yarn splitting. 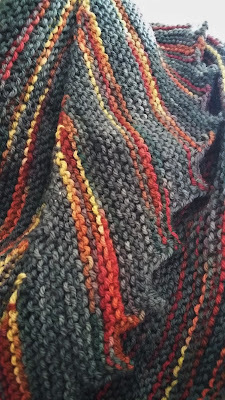 The few times I forgot to decrease for the 'teeth' and had to rip out a a row or twenty, the yarn behaved perfectly. It ripped without snagging and knit back up without that weird, wrinkled look you get sometimes. I just can't say enough good things about this yarn from Three Waters Farm. To see what others are crafting today, join me over at Frontier Dreams for today's #Craftingon link-up. That's one beautiful scarf! Those stripes look like the yarn was designed for this pattern (or the other way around). Thanks! The shop's yarn supply is looking a little sad. 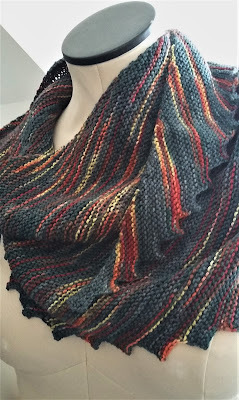 I hope they restock soon because the yarn was a delight to knit with. I'd love to get my hands on more. I love the pop of the stripes, it's absolutely beautiful! Thank you! I'm super happy with the way it turned out. A year ago I was Hitchhiker crazy, I made so many of them as gifts, I could not stop. I love yours, beautiful yarn.